To Celebrate their 20th Year as a tertiary education provider in New Zealand, the managing directors of NZIE (New Zealand Institute of Education) wanted to do something fun and exciting with their brand to honour their unique place in New Zealand’s education sector. 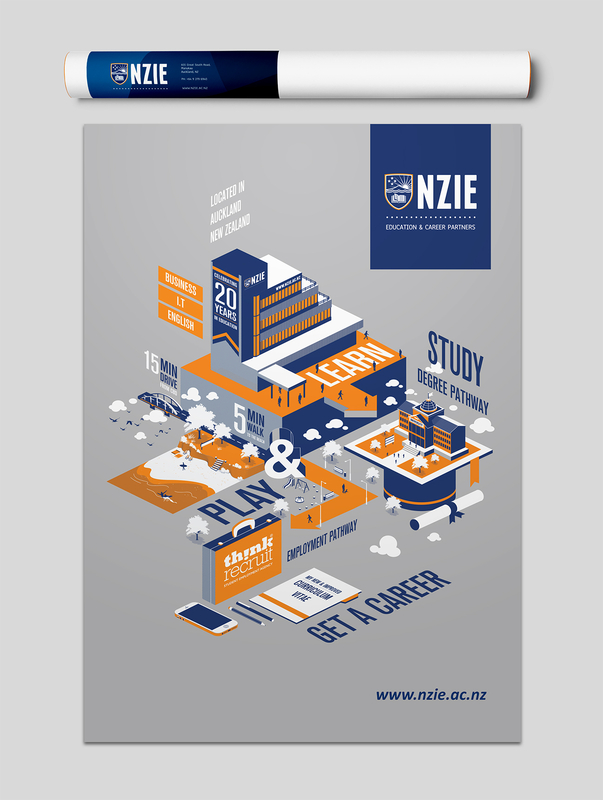 To answer this, I came up with an isometric illustration which highlighted all the great reasons to study at NZIE. This being the experience as an NZIE student; the opportunity to “Play & Learn” while working towards achieving their goals of a higher education. After all; where else can you study business which has a sunny beach within a 5 minute walk. Or offer a service to help you find your first job, or get you into a top University in NZ? All of which was done in a fun and colourful manner without steering away from their corporate persona & identity.